A Happi Coat is a shorter length version of the kimono. 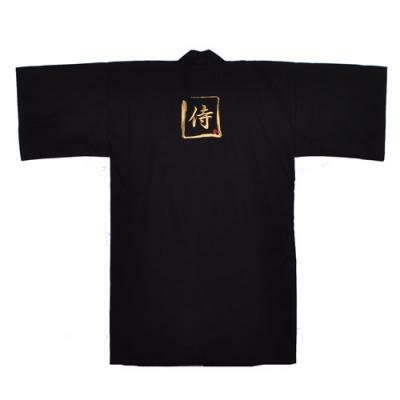 This distinctive black warrior Happi Coat is embroidered with a 6" square, gold satin "Samurai" calligraphy symbol on the back and a red Sakura crest on each front panel. Made in Japan of 100% shantung cotton. Shantung is made from cotton spun fibers providing a weave design with a ribbed effect. Slubbed yarns are used in the weave of the material. This produces a durable, nubby fabric which contains an airy feel with rich texture and visual attraction. This comfortable, shorter length Kimono includes a matching belt. For sizing reference, girth is the entire width of the fabric, so this robe easily adjusts to many waist sizes and is designed to wrap around and fastened with the belt. For length, you can measure yourself with a tape measure from the top of your shoulder and down your side to determine where the length would fall on you. This is a fabulous robe. I like the shorter length and the embroidery is first class. My new favorite robe.